On a recent trip over to Amberley Castle, near Arundel in West Sussex, I felt a bit like the hapless foreigner who bought London Bridge thinking that it was Tower Bridge. We queued for the museum and started to look around the various buildings and exhibits. “Is the castle along here?” I asked a member of staff. “What castle?” he said. Okay, so Amberley Castle is situated further along the road and I went to the wrong place but that turned out to be a blessing in disguise. The Amberley Working Museum was built in the old chalk pits that were in use from the 1940s to the 1960s. Chalk was quarried and burnt in kilns to make lime. Put simply, lime is the product of heated chalk and coal. Cement is produced if clay is added to the mix. Either may be used with sand as mortar between bricks, but cement is easier to work as it dries far quicker though lime is more flexible and therefore doesn’t crack as easily. Cement mixed with sand becomes concrete which is an absolutely essential modern building material as the Concrete Exhibition, housed in one of the former bagging sheds, points out. The Museum is a slideshow of our fine industrial past though the layout of the place is what I found particularly interesting. The old industrial buildings have all been put to good use and are scattered around the site along winding paths and tucked away in small valleys or hidden by trees. Each contains a different exhibit. The various displays include pottery, bricks, telephones, tools, gin and even broom-making. On the particular Sunday that I visited, there was also an outdoor steam show with around 100 working steam engines on display. 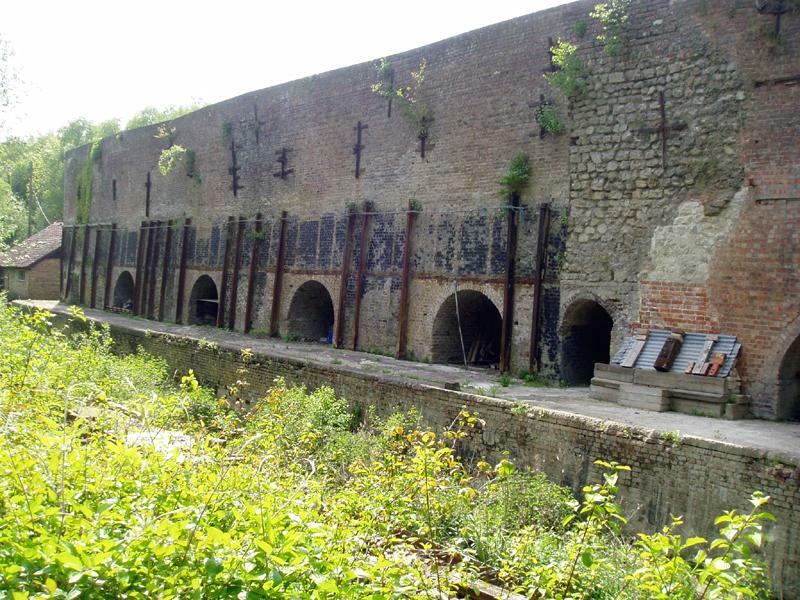 Many of the original quarry features have survived such as the De Witt kilns – an English Heritage Scheduled Ancient Monument that is soon to be restored. Originally the nearby railway would have come straight into the quarry to pick up and deliver goods so the train rides around the site (included in the price) are certainly relevant. The Amberley Working Museum puts the nearby derelict Shoreham Cement Works to shame in that a suitable use for the site has long been found. I thoroughly recommend that you take a trip over to Amberley this summer – even if it’s not to see the castle. Call the museum on 01798 831370. The Brighton Festival offers excellent opportunities to view the interiors of beautiful buildings that are normally closed to the general public. I was delighted to find the Middle Street Synagogue on the list this year so made sure that my name was down for a guided tour at the earliest opportunity. Middle Street, in-between and parallel to West Street and East Street, was the earliest street to be developed in the centre of the Old Town of Brighthelmston. There are six listed buildings along its length, the most notable being the Mecca Bingo Hall and the Synagogue (no. 66) which was Grade II* Listed in 1971 on behalf of its sumptuous interior which has been described as one of the finest in Europe. The Synagogue was built in 1874-5 to the designs of the Brighton architect Thomas Lainson, the surveyor of the Wick Estate. Interestingly, he was not Jewish, but won the contract after it was put out to tender. Its basilican shape gives it a Romanesque feel though it was principally built in the Byzantine style, signifying rich colours, mosaics and plenty of gold. 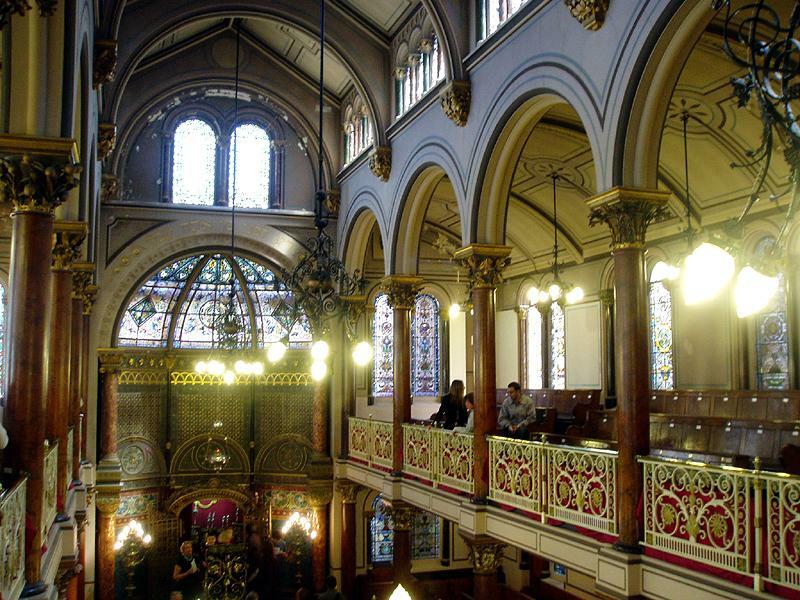 It replaced an earlier synagogue on Devonshire Place and was consecrated on 23rd September 1875. The yellow brick façade is impressive though unremarkable. Corinthian columns flank the main door and numerous windows with voussoirs of red and blue tiles. A large pediment with Composite pilasters and an imposing circular window in the centre, gives little away about what lies within. The interior is remarkable. The upper galleries on three sides are supported by red marble columns with capitals showing the fruits of the Old Testament. Cloth draped over the balcony railings protects the modesty of the female members of the congregation, who always sit upstairs. Men always sit on the ground floor which boasts many fine gold ornaments – including two candelabrums from the Rothschild family. In the late 1800s, beautifully abstract stained glass windows were added. Many further improvements were made until 1914 through the splendid generosity of the Sassoon family. It was the first British synagogue to be equipped with electric lights and the Everlasting Light hangs above the Ark, remaining lit at all times. Due to falling numbers, the congregation now meets on New Church Road in Hove. This leaves the future of the building not entirely certain as responsible maintenance is costly. Making it a museum would be a perfect solution. Shalom!